Dili (Agenzia Fides) - Jesuits in Timor-Leste are committed to guaranteeing and promoting quality education in society. With this in mind, the "São João de Brito" (ISJB) training institute was established with the aim of "producing new generations of teachers who have professional competence and deep ethical grounding", explained to Fides don Joaquim Sarmento SJ, at the head of community of the Society of Jesus in Timor-Leste. As Fides learns, one of the identified needs, in fact, is that of qualified teachers who accompany the growth of young people. The de Brito institute was born to respond to this need and to counter-help the nation to tackle this problem. The new academic year began on April 30th. Addressing the students, Fr. Sarment said: "Here one develops not only your intelligence but also your desire to serve the future generation of the country. You will have quality education at this school, so make the most of this opportunity"
The Government of Timor-Leste sent teachers employed in public schools to the Jesuit Institute to strengthen and perfection their skills. Professor Marie Emmitt, Australian, long-time consultant for the Jesuit Education Project said that the Institute "is responding well to the mission and vision of the educational project for which it was born: it will be a great institution". Timor-Leste achieved independence in 2002, after two periods of colonialism and after serious violence, especially after 1999. As a result of these conflicts, the country was almost destroyed and lost its skilled workforce in all sectors, including education. For real independence it is essential to rebuild infrastructure for all sectors, and above all, to prepare technicians and professionals who can guarantee the autonomy of society and the sovereignty of the state. In this context, education plays a key role. The Government of East Timor-Leste has looked for ways to enhance national education, one of which is teacher training. 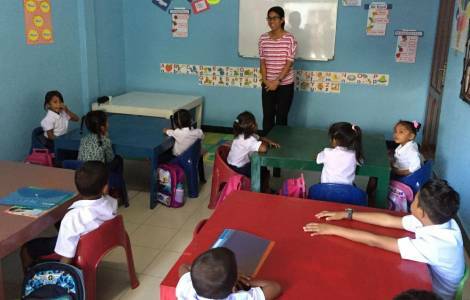 In recent years, the government in Timor-Leste has invested in fundamental aspects of the education sector, such as the reconstruction of educational infrastructure and the improvement of the educational system.